Smothered Pork Chops are juicy, tender and easy to make. These pan seared pork chops are smothered in a mouthwatering French Onion gravy made with caramelized onions and topped with melted cheese! This pork chop recipe has all the amazing flavors of French Onion Soup atop tender boneless pork chops. The combination of flavors is amazing, rich and decadent! 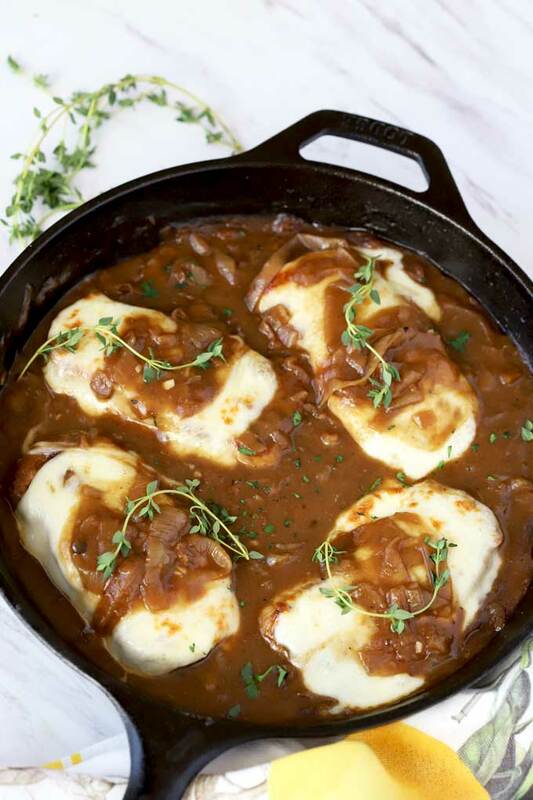 These French Onion Smothered Pork Chops are truly a restaurant quality meal made simply in one skillet in about 35 to 40 minutes!! 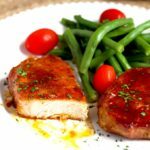 Pork Chops are one of my favorite, easy, quick and delicious go-to meals, especially on busy days. These smothered pork chops are easy and quick enough for hectic weeknights, and fabulous enough to serve at a dinner party. What Kind of Pork Chops To Use For This Recipe? Do I need to Cook the Pork in the Oven after I Pan Sear them? What Is the Safe Temperature For Pork Chops? JUST TAKE ME TO THE PORK CHOP RECIPE ALREADY! If you would rather skip my tips, tricks, essential cooking information and similar recipe ideas and get straight to this delicious pork chop recipe – simply scroll to the bottom of the page where you can find the printable recipe card. But, you may be missing out on some good stuff! Choose pork chops that are about 3/4 to 1 inch thick. Although thinner pork chops may work for this recipe (if cooked less than the time specified below), they may not be really suitable to hold on to the cheese and be smothered! 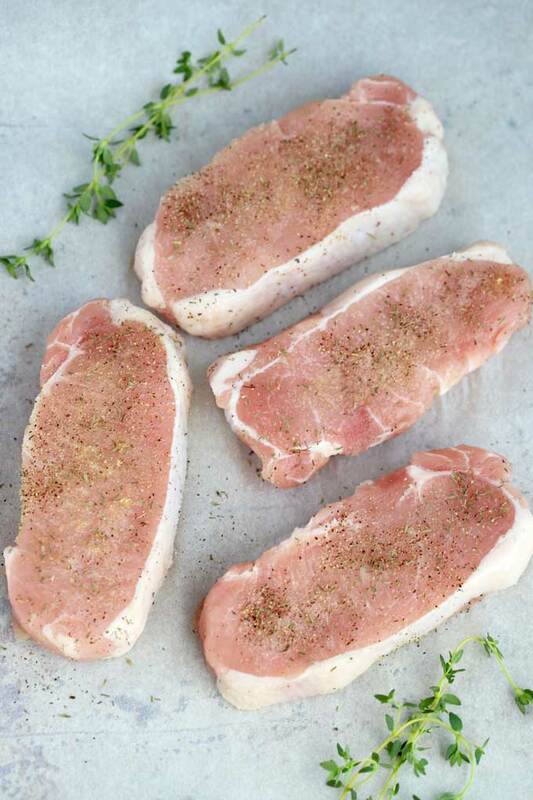 There are many different cuts of boneless pork chops sold at the market. Although all of them work, for this recipe I used boneless loin chop. Caramelized onions are absolutely delicious and pair so well with savory, salty things like meat and cheese. The only trick to perfect caramelized onions every single time is PATIENCE! 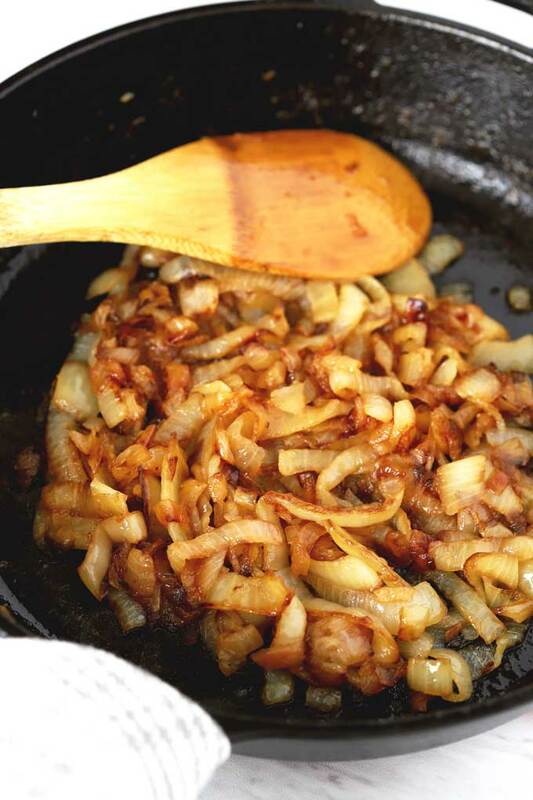 The biggest misconception about caramelizing onions is thinking that you need to add sugar or broth to the onions. 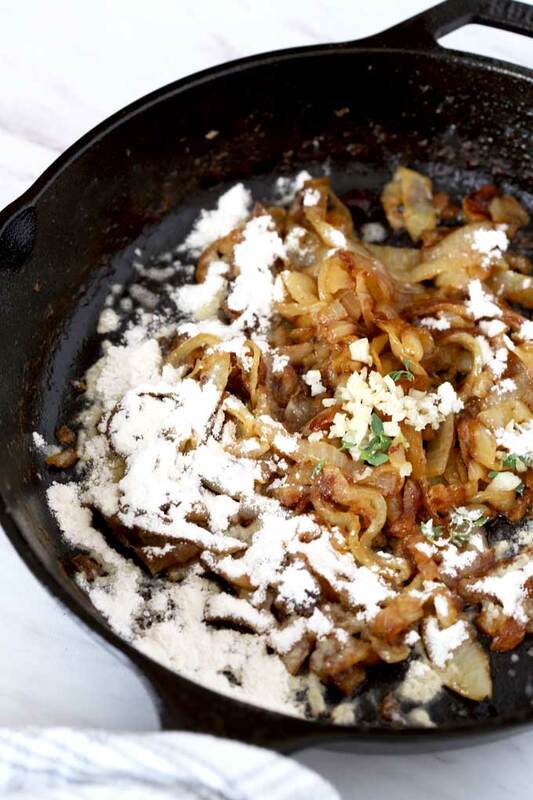 The only ingredient needed for perfect caramelized onions is onions! 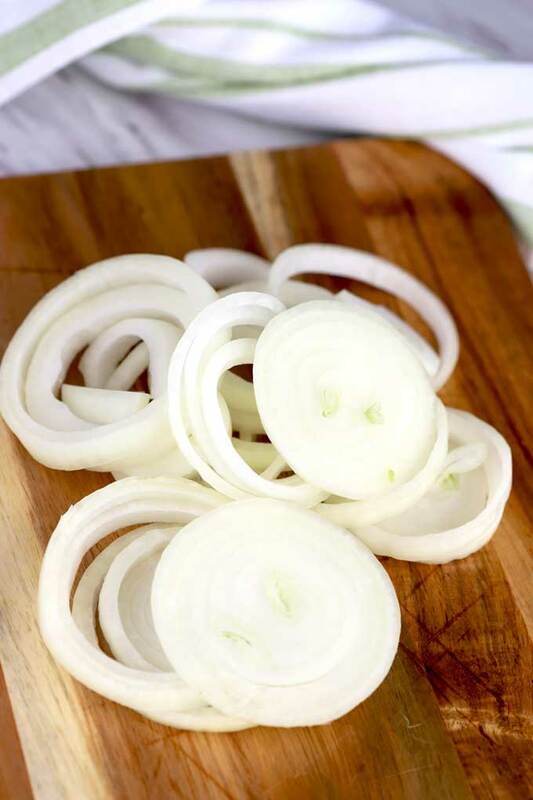 Cut the onion slices evenly. No – you don’t need a ruler to measure each slice. Just try to cut all the slices to the same thickness. Low and slow wins the perfect caramelized onion race! Do not rush the process by turning the heat on high. Onions need time to release it’s own sugar and turn golden in color. Caramelized onions can take up to 40 minutes to get perfectly golden. In this recipe, we caramelized them for about 20 minutes with amazing results and flavor. However, remember low and slow is the best way to reach perfection. Just because we are cutting the process a bit short, doesn’t mean we will crank up the heat to get them done. We want caramelized onions not charred onions! Place oil and butter in a skillet over medium heat. When the butter is melted, add the onions. Cook stirring frequently until the onions are golden and caramelized. Turn the heat to low if you see that the onions are getting dark on the edges too fast. Bring the pork chops to room temperature. In this smothered pork chop recipe, you season your pork chops and let them sit on the counter while you cook your onions. This way the pork is not refrigerator-cold. Add oil to a skillet (cast iron works best) and when the oil is hot but not smoking, add the pork chops. Pan sear the pork chops over high heat, turning once. There’s no need for constant flipping! Pan sear the pork chops until they are golden brown and have a bit of crust on the first side, then flip and brown the other side. At this point, the pork is not completely cooked through. 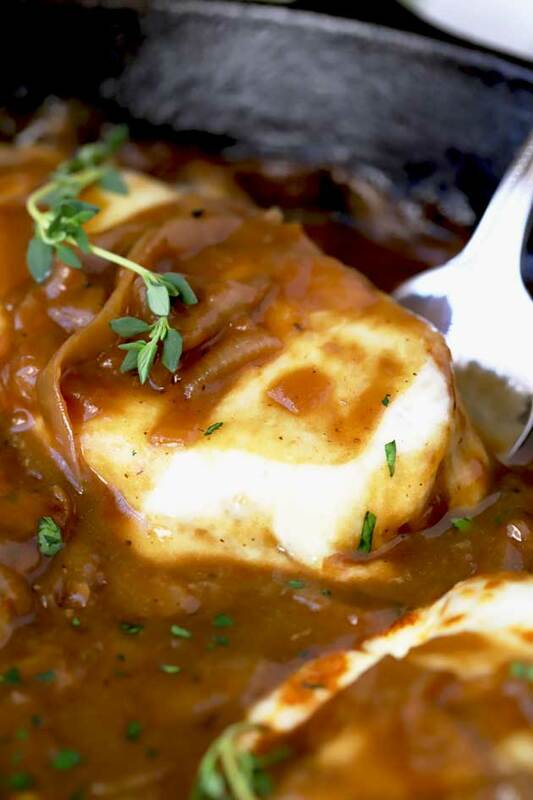 In this recipe, we will finish the cooking on the stove top while the pork chops are nestled in the delicious and rich French Onion sauce/gravy. 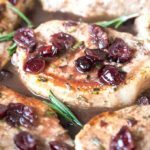 For some recipes like this Skillet Pork Chops with Port and Cranberries, you pan sear the pork chops in a skillet and finish the cooking process in the oven. For this recipe, we finish the cooking process on the stove top. We will use the broiler only to melt the cheese, although that can also be done on the stove top by simply covering the skillet with a lid until the cheese melts. Season the pork chops on both sides. Sear the pork chops until golden brown. 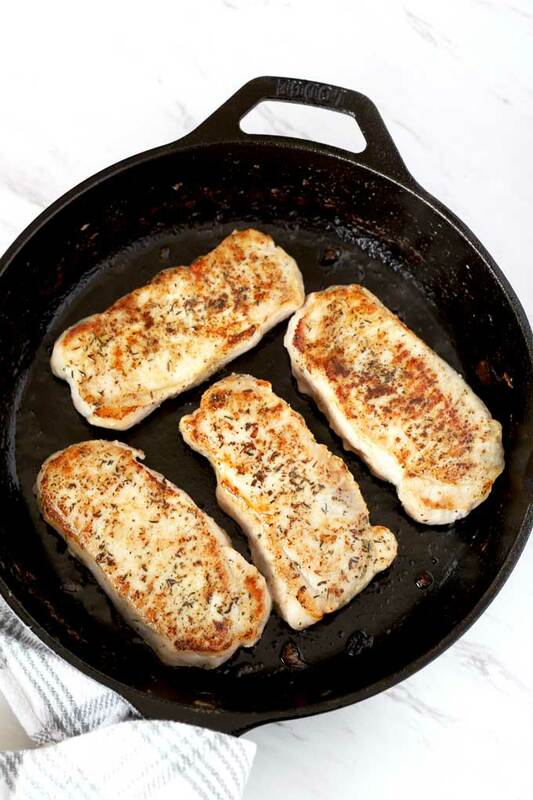 Remove the pork chops from the skillet and set aside. Return the caramelized onions to the skillet, stir in the garlic and thyme and cook for about a minute. Sprinkle the flour and mix well. Cook for 2 minutes, stirring constantly. Stir in the wine and mix well. Stir in the broth, Worcestershire sauce and Dijon mustard. Mix until well incorporated. Season to taste with salt and pepper. When the sauce comes to a simmer, nestle the pork chops in the sauce. Cover and cook for about 5 minutes or until the desired temperature is reached. Top the pork with the cheese and broil until melted. The secret to perfectly tender, melt in your mouth and juicy pork chops is to not over cook them! It is important to keep a watchful eye to prevent dried up and chewy pork chops. Yes, pork chops should be treated like steak when it comes to cooking temperatures. A tender, juicy and full flavored pork chop should have a little trace of pink in the middle. The USDA’s safe temperature guideline for pork chops is 145 degrees Fahrenheit. Always use an instant read thermometer and check the temperate 5 minutes before you think it is done! You can use cheese slices or shredded cheese for this recipe. Mozzarella, provolone, Swiss and Gruyere cheeses are all great options. 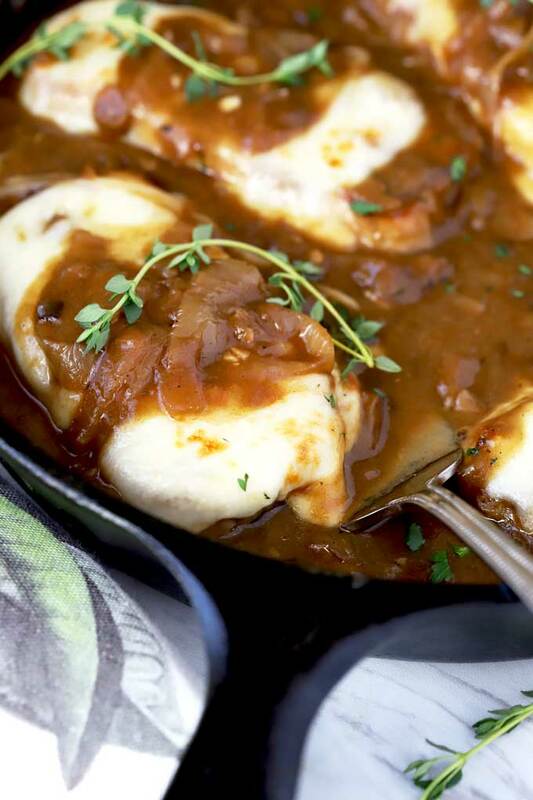 WANT TO TRY THESE FRENCH ONION SMOTHERED PORK CHOPS? Season the pork chops with salt, pepper, garlic powder and dried thyme on both sides. Set aside. Heat a 10 inch skillet over medium heat (an oven safe or cast iron skillet if you are using the broiler to melt the cheese). Add the olive oil and butter. When the butter is melted, add the onions and cook stirring regularly for about 15 to 20 minutes or until the onions are golden brown and caramelized. If the skillet gets too hot, turn the heat to medium-low. You want the onions to cook slowly, not to get charred. Remove the onions from the skillet and set aside. Drizzle a bit of olive oil into the skillet, if needed. Turn the heat to high and sear the pork chops for about 1 to 2 minutes per side or until golden brown. Remove onto a plate. At this point, the pork chops are not cooked through. Turn the heat to medium and return the onions to the skillet. Stir in the garlic and 1 teaspoon of fresh thyme. Cook for a minute. Sprinkle in the flour and mix well. Cook for 2 minutes, stirring constantly. 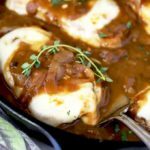 These look so good, I love french onion anything, and pork is one my family’s favorite proteins! Thanks for all the tips! I love the flavors of french onion on anything and pork is our favorite! I can’t wait to try this recipe! I have everything I need to make this tomorrow night! I can’t wait to try the gravy, YUM!!! We eat pork chops a couple of times a month, so this is going on our menu. 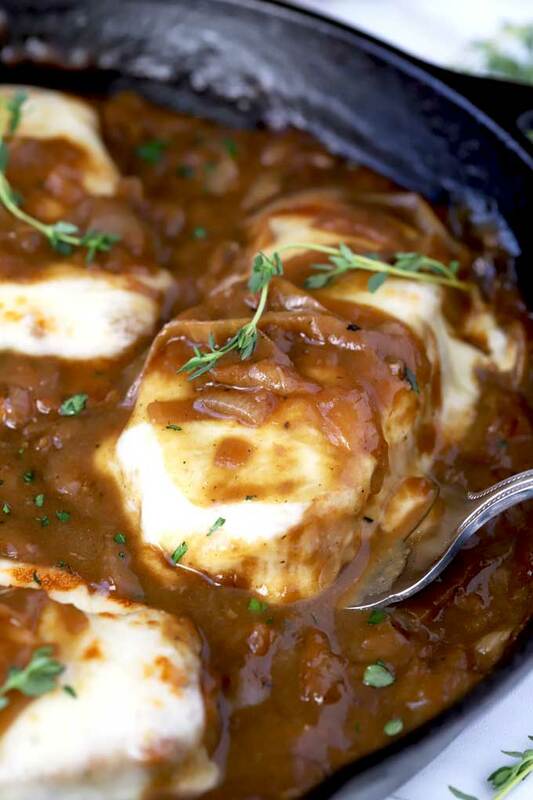 Love all that sauce and caramelized onions are so delicious! I have guests last night and we were all delighted with this recipe. Thank you Kathy, one more time you saved my day!!! This is the perfect recipe for when company’s coming! I love the flavors going on here. We love pork chops!! I know this will be a winner! French onion ANYTHING is my favorite! 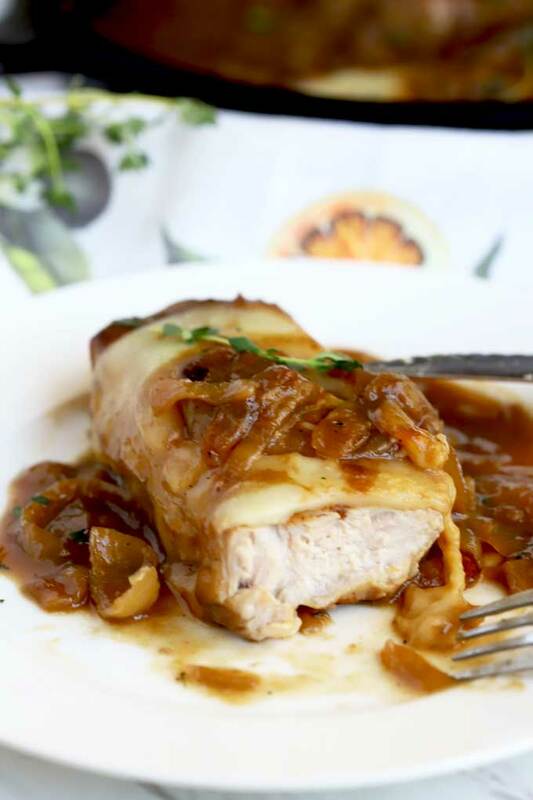 What a fantastic idea to make French Onion smothered Pork Chops. I just added this to our meal rotation!!! I Love how you outline all the steps and give so many great tips to making these pork chops. It looks easy to make and so delicious. Connor usually won’t eat anything with sauce on it but I think these just changed his mind! He couldn’t stop eating them and even ran his finger through the sauce on his plate so he didn’t forget any!